Food Production Consulting from Garden and Farm, to Food Product and Nutritional Supplement Production with a focus on the Ultimate Nutritional Content, Superior Flavor, and Extended Shelf Life achieved with Environmentally-Sustainable methods. The aim is to “Create Health from the Soil Up” by producing exceptionally nutrient rich foods using “Beyond Organic” techniques. I work with gardeners and farmers performing soil and plant tissue tests to determine what their plants need to express their full potentials, and create “Beyond Organic”, Nutrition Grown™ quality foods. I am an avid horsewoman, so I enjoy working with horse people to improve their pastures and help their equine friends experience the best in life. Be a part of the Next Big Wave in the nutrition marketplace–Go “Beyond Organic”! More farmers using “Beyond Organic” methods are needed. More “Beyond Organic” food product and nutritional supplement producers are needed. Consumers want the best quality. Buyers are ready, ARE YOU? Let’s work together to bring GREAT products to the marketplace! On-site Visit Package (Big Island of Hawai`i only)—includes Dr. Bogs driving to your site, site evaluation and discussion for up to one (1) hour, collection of soil and/or plant tissue samples, one Nutrition Grown™ soil analysis and microbial analysis (descriptions below) with full interpretation, specific recommendations and application tips, sample preparation, packaging, mailing, and postage. (Discounted rates for additional analyses.) Package also includes up to thirty (30) minutes per analysis follow-up phone conversation with Dr. Bogs. Package price (anywhere on the Big Island) $400. Receive a Discount—Refer a neighbor to get an on-site visit package done the same day and each of you will receive $50 off the package price. Contact us here. Nutrition Grown™ Soil Analysis (available widely, on and off the Big Island)—comprehensive analysis of a broad spectrum of elements in the soil that are essential for growing excellent crops. If your soil lacks specific minerals the report will tell you which soil amendments to buy, where you can find them and how best to apply them. The analysis is much more extensive than most soil analyses and includes 18 mineral elements (including important, but often overlooked, elements such as cobalt, molybdenum, and silicon), pH, organic matter, electrical conductivity, and cation exchange capacity, with full interpretation, recommendations, amendment sources and application tips. Soil analysis includes up to thirty (30) minutes per analysis follow-up phone conversation with Dr. Bogs so you can truly understand the analysis and move forward. $149 for first analysis/discussion; $99 for each additional analysis/discussion ordered at the same time. (First analysis included in the Big Island On-site Visit Package.) Click here to learn more and order. Microbial Analysis—for soil, compost, microbial inoculants, etc. checked with a quality microscope for bacteria, fungi, protozoa and nematodes; with recommendations. $100 for first analysis, $75 for each additional analysis ordered at the same time. (First analysis included in the Big Island On-site Visit Package.) Available on the Big Island of Hawai`i only due to shipping restrictions. Click here for additional info. 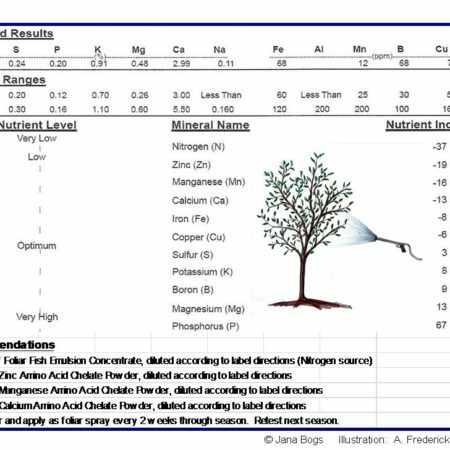 Metals (including Toxic Metals) Soil Analysis—This analysis is intended mainly for those individuals interested in toxic metal assessment, however it does include some metals with nutritional benefits. It includes Arsenic, Cadmium, Chromium, Copper, Iron, Molybdenum, Nickel, Lead, Selenium, Vanadium, and Zinc. Contact us for additional info. Toxic Chemical Analyses–Concerned about persistent toxins that may be present in your soil from toxic farming practices in the past, such as on old sugarcane land? DDT, organochlorines, organophosphates, lindane, etc. can be items to be concerned about. Contact us with your specific concerns. Plant Leaf Tissue Mineral Analysis—comprehensive analysis including 12 mineral elements, with full interpretation, recommendations, and foliar spray application tips. $100 for first analysis; $75 for each additional analysis ordered at the same time. Click here to learn more. Plant Nutritional Content Analysis–This type of plant tissue analysis is used to check the nutritional content of your final food product (i.e. 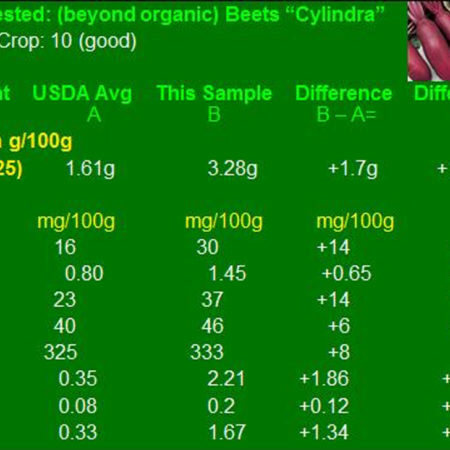 beet roots, lettuce leaves, carrot roots, apples) and is then compared to USDA Food Nutrient Database values. Click here to learn more. Brix Testing—soluble solids content (SSC) analysis for plant tissue, including leaves, fruit, etc. This gives a general indication of nutrient density. Available on the Big Island of Hawaii only due to shipping restrictions. Contact us. Consulting Time—for farmers, gardeners, food product companies, nutritional supplement companies, island newcomers seeking relocation advice, and related needs. $120 per hour, billed in 15-minute increments. (The Big Island on-site visit packages include up to one hour of Consultant time to discuss crop concerns, based upon arrival at the site. Additional consulting time will be billed in 15-minute increments at $120 per hour.) Contact us. Crop or Project Management by Consultant—coordinating work crews, ordering amendments, expert application of amendments or foliar sprays, etc. $60 per hour. Contact us. Services requiring Travel off the Big Island of Hawai`i—Please inquire about travel and per diem expenses. 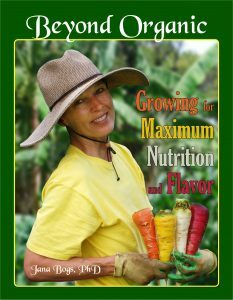 Book by Dr. Bogs—Beyond Organic…Growing for Maximum Nutrition and Flavor—with shipping included. Full color $29.95 or B & W $21.95 Click here to order. Autographed Book by Dr. Bogs—Beyond Organic…Growing for Maximum Nutrition and Flavor—full color with personalized autograph and shipping included. $35 Click here to order. Billing/Payment— All goods and services sold in Hawaii are subject to general excise tax, which will be added to the bill. Full payment is due at end of site visits and before analyses are performed. Full payment for products is due before shipment or at pick-up/delivery. Consulting time is billed in 15 minute increments, with client billing done at least once per month, depending on the situation. Checks are to be made payable to Beyond Organic Consulting, Inc. The Client will be provided with a receipt by email. All fees associated with dishonored checks are the responsibility of the Client. Disclaimer—Any recommendations provided by Beyond Organic Consulting, Inc. and/or Dr. Jana Bogs are advice only. As no control can be exercised over application of recommendations, product storage, handling, mixing application or use, or weather, plant or soil conditions before, during or after application (all of which may affect the performance of our program), no responsibility for, or liability for any failure in performance, losses, damages, or injuries (consequential or otherwise), arising from such application, use, handling, storage, or mixing, will be accepted under any circumstances whatsoever. The buyer assumes all responsibility for the use of any of our products, advice and/or recommendations.